Back pocket wallet is a red rag to a chiropractor. Back pocket wallet gives you three good reasons to carry your money in a pouch around your waist or jacket. You've got to pick a pocket or two. Have you ever read Oliver Twist by Charles Dickens? Then you will know the first good reason. If you haven't, you're missing out on a treat. It's one of the great books of all times. It's a sobering thought that if you read just one book a month, you'll probably not get through much more than 500 tomes in your whole life. Did you know that ten thousand are published in the UK every month? Anyway, if you are a chiropractic patient, I hope you'll read one of mine. A frog in my throat is alas sold out and out of print, but you could enjoy Stones in my clog on your kindle or tablet. I won't say that carrying your wallet in your back pocket is a cause of frozen shoulder, but it's very awkward for almost all arm conditions which limit internal rotation. Getting your wallet out of your back pocket involves what we call the Apley's scratch movement which involves internal rotation and extension of the shoulder; it's murder for those with a frozen joint and one of the most painful and debilitating conditions treated at the chiropractic help clinic. Frozen shoulder usually comes about with frightening rapidity after an injury that is not well managed; the lower cervical spine or first rib is usually involved. Reaching for your back pocket wallet is virtually impossible. Read more about Frozen Shoulder … and some specific exercises. 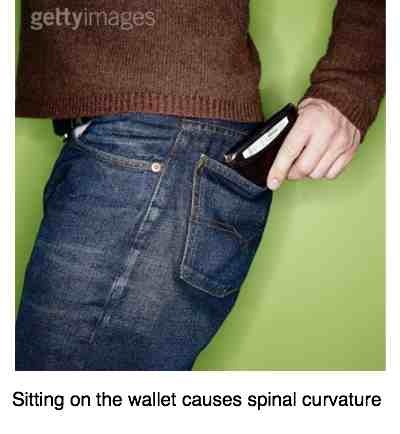 Sitting on your wallet, in the car or at your desk, obviously also will give you temporarily a crooked spine, because it raises one side of the pelvis. Only slightly you may say, but believe you me, it's significant. 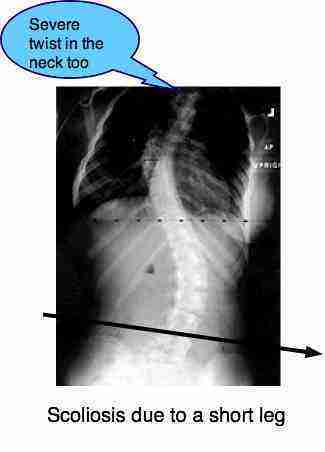 That curvature is only temporary, obviously; only whilst sitting on your back pocket wallet but you can see how a scoliosis, whether for a few moments or permanent, reaches up into the cervical spine. It can and does play havoc with your spine causing headaches and a variety of spinal complaints that continue long after you get out of the car. Because this twist in your back reaches right up to the skull, it has the same effect, albeit of a temporary nature, on your spine as a short leg. Sacroiliac joint anatomy is often involved. Go from Back Pocket Wallet to Chiropractic Tips. 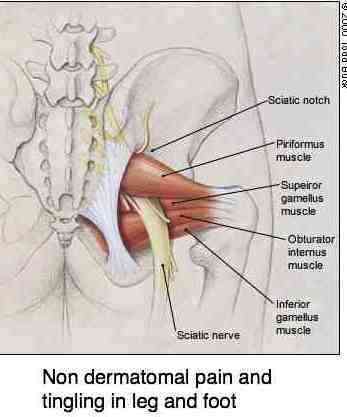 The sciatic nerve emerges from the pelvis right in the middle of the buttock, just where your wallet fits. Direct, prolonged pressure on the area is likely to irritate these sensitive structures. Chiropractic wisdom declares this to be good for our business and bad for your health. Obviously I speak in jest, but seriously, if you suffer from chronic lower back and buttock pain, even radiating down the back of your leg, it would be wise to carry your wallet elsewhere. Personally I use a pouch which I clip around my waist. Incidentally, if you do suffer regularly from lower back pain, I strongly recommend the exercises that you'll find in the navigation bar on the left. They take no more than two minutes and, done faithfully every morning before getting out of bed, they will make a significant difference to the health of your lumbar spine. Just like those exercises will to your shoulder. Another thought about chronic joint pain; interesting research shows that ten percent of folk around sixty, and probably significantly higher the older you get, suffer from a magnesium deficiency, and it's strongly implicated in chronic arthritis. Many drugs leach the body of magnesium, and of course our western world is not known for a love of a healthy diet. Spinach, cooked or raw is the solution. Now how about eggs florentine twice a week? On toast unless you are banting, in which case of course you want to keep your carbohydrates way down. 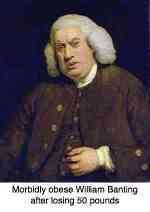 Have you got arthritis in your fingers, and in your neck, and in your knee...? Think magnesium. The deficiency predisposes you to a condition known as chondrocalcinosis, or painful calcium deposits in the hyaline cartilage in your joints. Do you need to lose a lot of pounds? Serious consider the Banting diet but do make sure you have plenty of greens or your homocysteine levels will soar. Stones in my Clog is Bernard Preston's third book of chiropractic anecdotes; I'm not sure you'll find any stories about a back pocket wallet there, but he and Helen were once pick pocketed in Copenhagen; watch your bag ladies. A pouch is much safer when travelling.